The Stark Raving Viking: Police using microwave radiation to spy inside your home? Police using microwave radiation to spy inside your home? How safe is a device that can see through bricks and mortar, some metals, and multiple walls? How safe are US citizens without sovereignty and a US Constitution? The US Constitution is the rule book for the US Government. It the corporate and banker government of occupation does not follow our rules, why should we follow theirs? Why are we funding our own abuse? The above image and below text was cut and pasted [from here]. "The idea that the government can send signals through the wall of your house to figure out what's inside is problematic," said Christopher Soghoian, the American Civil Liberties Union's principal technologist. "Technologies that allow the police to look inside of a home are among the intrusive tools that police have." Justice Department spokesman Patrick Rodenbush said officials are reviewing the court's decision. He said the Marshals Service "routinely pursues and arrests violent offenders based on pre-established probable cause in arrest warrants" for serious crimes. 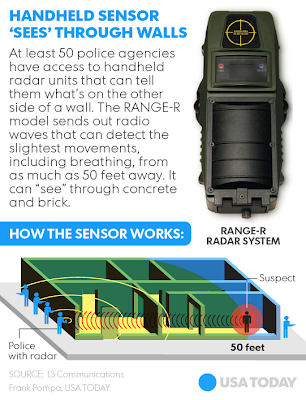 The device the Marshals Service and others are using, known as the Range-R, looks like a sophisticated stud-finder. Its display shows whether it has detected movement on the other side of a wall and, if so, how far away it is — but it does not show a picture of what's happening inside. The Range-R's maker, L-3 Communications, estimates it has sold about 200 devices to 50 law enforcement agencies at a cost of about $6,000 each. The radars were first designed for use in Iraq and Afghanistan. They represent the latest example of battlefield technology finding its way home to civilian policing and bringing complex legal questions with it. Those concerns are especially thorny when it comes to technology that lets the police determine what's happening inside someone's home. 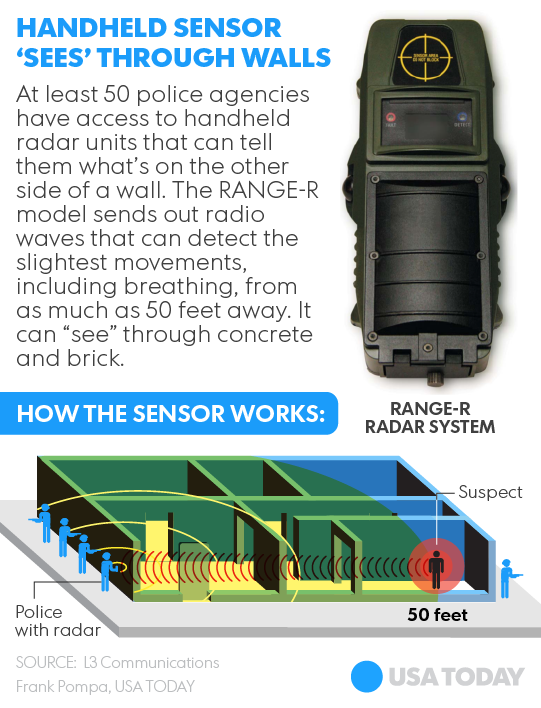 The Supreme Court ruled in 2001 that the Constitution generally bars police from scanning the outside of a house with a thermal camera unless they have a warrant, and specifically noted that the rule would apply to radar-based systems that were then being developed. In 2013, the court limited police's ability to have a drug dog sniff the outside of homes. The core of the Fourth Amendment, Justice Antonin Scalia wrote, is "the right of a man to retreat into his own home and there be free from unreasonable governmental intrusion." Still, the radars appear to have drawn little scrutiny from state or federal courts. The federal appeals court's decision published last month was apparently the first by an appellate court to reference the technology or its implications. That case began when a fugitive-hunting task force headed by the U.S. Marshals Service tracked a man named Steven Denson, wanted for violating his parole, to a house in Wichita. Before they forced the door open, Deputy U.S. Marshal Josh Moff testified, he used a Range-R to detect that someone was inside. Agents arrested Denson for the parole violation and charged him with illegally possessing two firearms they found inside. The agents had a warrant for Denson's arrest but did not have a search warrant. Denson's lawyer sought to have the guns charge thrown out, in part because the search began with the warrantless use of the radar device. Three judges on the federal 10th Circuit Court of Appeals upheld the search, and Denson's conviction, on other grounds. Still, the judges wrote, they had "little doubt that the radar device deployed here will soon generate many questions for this court." But privacy advocates said they see more immediate questions, including how judges could be surprised by technology that has been in agents' hands for at least two years. "The problem isn't that the police have this. The issue isn't the technology; the issue is always about how you use it and what the safeguards are," said Hanni Fakhoury, a lawyer for the Electronic Frontier Foundation. The Marshals Service has faced criticism for concealing other surveillance tools. Last year, the ACLU obtained an e-mail from a Sarasota, Fla., police sergeant asking officers from another department not to reveal that they had received information from a cellphone-monitoring tool known as a stingray. "In the past, and at the request of the U.S. Marshals, the investigative means utilized to locate the suspect have not been revealed," he wrote, suggesting that officers instead say they had received help from "a confidential source." William Sorukas, a former supervisor of the Marshals Service's domestic investigations arm, said deputies are not instructed to conceal the agency's high-tech tools, but they also know not to advertise them. "If you disclose a technology or a method or a source, you're telling the bad guys along with everyone else," he said. Michael Chertoff is a former prosecutor of big name Mafioso. Chertoff is worse than any mobster forcing us to pay taxes for million dollar plus naked body scanners. Head the US Department of Homeland Security DHS, then go work for a corporation and use your influence to sell crap that Americans didn't ask for or need. Chertoff is a whore of our corporate/banker occupation. John Gotti was a walking bag of excrement. Chertoff is Satan in comparison, and prosecuted figures like Gotti. The worst tactics of organized crime, are the tactics of vermin like Chertoff. Who will prosecute official organized crime? The radar devices came out decades ago. They are to terrorize us for the house to house gun confiscation coming soon. All Americans will have to come out of their dwellings with their hands up to have their homes searched. The DHS is deputizing LA street gangs and others with the ability to intimidate and terrorize into submission. Foreign troops will also be enlisted for such duties.